1. Whisk the egg whites in a bowl until they form soft peaks, then set aside. In a separate bowl, mix together the ricotta, egg yolks and milk, and sieve in the flour, cocoa and baking powder. Fold the ingredients together until all the flour is incorporated, then fold in the whisked egg white and orange zest. 2. Place the rhubarb in a pan with the sugar and orange juice. Gently simmer, stirring occasionally, for 10 minutes until the rhubarb is just cooked. Remove from the heat and allow to cool slightly. 3. Heat a little vegetable oil and butter in a small non-stick frying pan. Place 2 generous spoonfuls of the pancake mixture into the pan and, using the back of the spoon, spread it to form cakes about 15cm round. Cook for 2–3 minutes until bubbles start appearing on the surface, then turn and cook for a further 3 minutes, or until golden and cooked through. Repeat to make 4 pancakes. 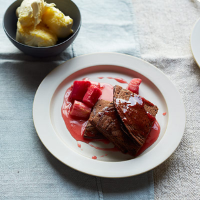 Serve hot, cut into quarters, with a spoonful of the poached rhubarb plus a dollop of clotted cream or crème fraîche, if you wish. This recipe was first published in Wed Nov 27 13:34:00 GMT 2013.